THANKSGIVING IS THIS WEEK!! my original flight home was for wednesday night, but then i thought i changed it to a tuesday afternoon one when really it’s for wednesday afternoon. good because i’m only missing 1 class (instead of the 3 i would have if it was a tuesday flight), but sad because i’m ready to blow this popsicle stand. anyways, despite those caps and going home for it (some people stay because it’s so close to finals), thanksgiving is not my favorite holiday. i use turkey solely as a vehicle for cranberry sauce, stuffing tastes like salty mush to me, and pumpkin (too smooth) / pecan (too sweet) pie are not my preferred desserts of choice. what’s that? you don’t want pumpkin or pecan pie either and you’re in charge of dessert and don’t know what to make?! i’ve got you all figured out. 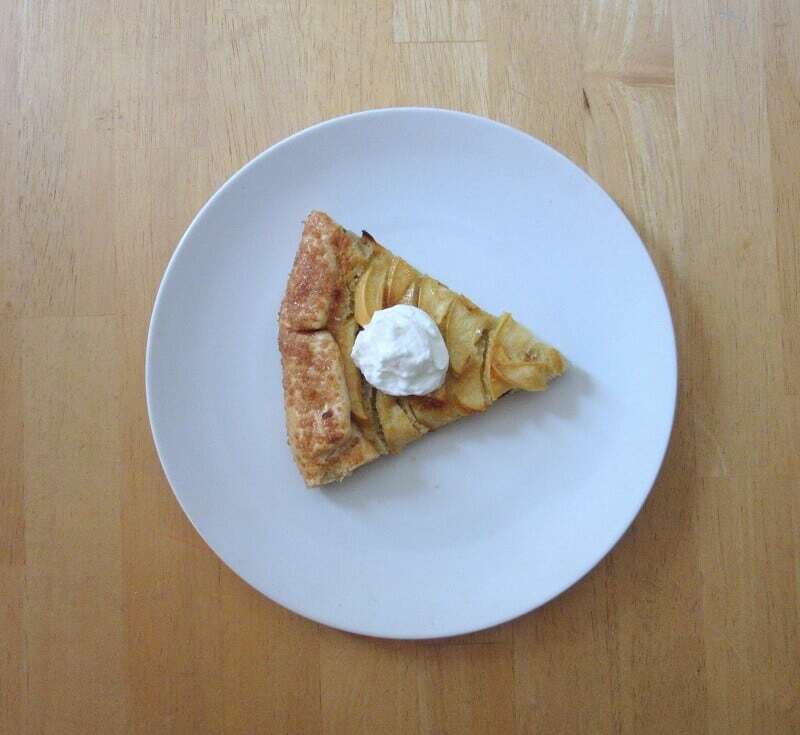 apple, spiced pumpkin and frangipane galette. you get fall pie flavors, but in a less stressful format, plus a little boost from the nutty almond-based frangipane. storebought or homemade crust works here. once upon a time, i made everything from scratch and refused to buy anything pre-made, especially in terms of lemon curd and pie crust. i’ve since relaxed from this stance, and find that so long as you buy a mostly or all butter crust, it’s fine. i like trader joe’s frozen one. and if you want to be that overachiever, go for it! my old stand-by was dorie greenspan’s, but use whatever one you want. what you get is a galette with the flakiest crust, accompanied by crunch from the sugar baked into it. sweet/tart apples that are tender but not falling apart and a hint of spice from the pumpkin butter round it out. 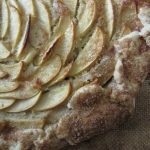 this apple, spiced pumpkin and frangipane galette is perfect for thanksgiving dessert: fruity and light enough that you can squeeze in a slice after the jello salad and garlic mashed potatoes and no mai fan, but with enough of the classic thanksgiving dessert elements (pie crust! apples! pumpkin! spices!) that you don’t feel deprived of the traditional. This apple, spiced pumpkin and frangipane galette is perfect if you're scared of making a normal pie, and if you want apple and pumpkin and can't decide! Combine everything in a small pot, and simmer until darker and slightly thickened (it will thicken more as it cools), 15-20 minutes. Transfer the pie crust to a parchment or Silpat-lined baking sheet. Patch up any cracks if necessary. Smear the pumpkin butter onto the dough, leaving a 2” border around the edge. Add the frangipane, and spread that on top of the pumpkin, leaving that same border plain. 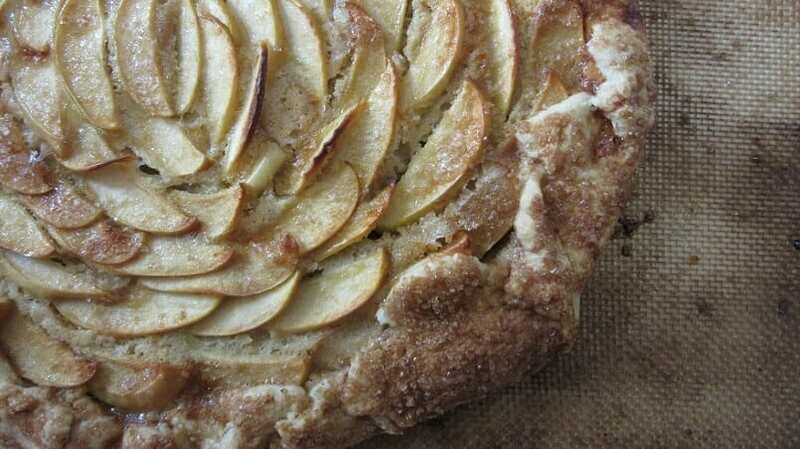 Arrange the apples on the frangipane in concentric circles, overlapping them slightly. It might seem like there's too many apples, but that's okay. Brush the apples and crust with the egg, then sprinkle with the sugar. Bake at 375F until the apples are tender, and the crust is golden, 50-60 minutes. Cool slightly before serving warm. Frangipane adapted slightly from Joy of Baking. I have always wanted to attend an American Thanksgiving. A holiday where the focus is what you put on the table? um yes please! Mostly for the pie and the sides. This pie sounds amazing – pumpkin butter is such a genius idea. wellll for some people it’s more about getting together with good company and reflecting on everything you’re grateful for (; but the food makes it fun! and i agree; the dessert and sides are my favorites and i usually just have the tiniest sliver of turkey for tradition’s sake. Have an amazing time at home!! I’m with you on not feeling the turkey/cranberry sauce/stuffing combo, but I’ve just discovered the pecan pie of my dreams – a dark chocolate and bourbon version. Negates the sickly sweetness you end up with all too often! Love the sound of this – so unique with the pumpkin butter, and cheers to rustic galettes over fiddly pie lattices!! thanks! and oooh, that pecan pie sounds perfect (bc i agree, it usually just tastes like gloopy corn syrup with a few nuts tossed in). It looks scrumptious. Just pinned it. Noms! “if you want to be an overachiever, go for it!” lol I love that so much. I actually love thanksgiving for all the food especially turkey and cranberry sauce but totally understand if you don’t. 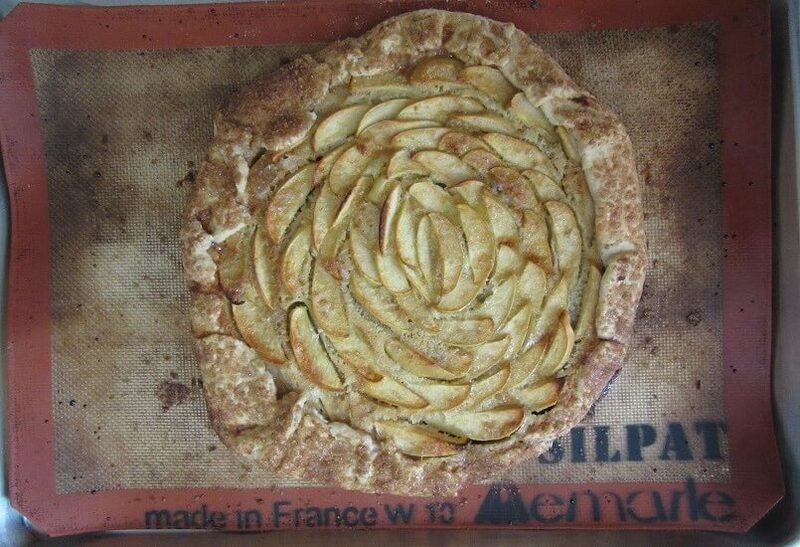 However, this galette looks so tasty. I love the crust and the layers of it. Ooooooh can I be your taste tester puh-lease?!?!? !